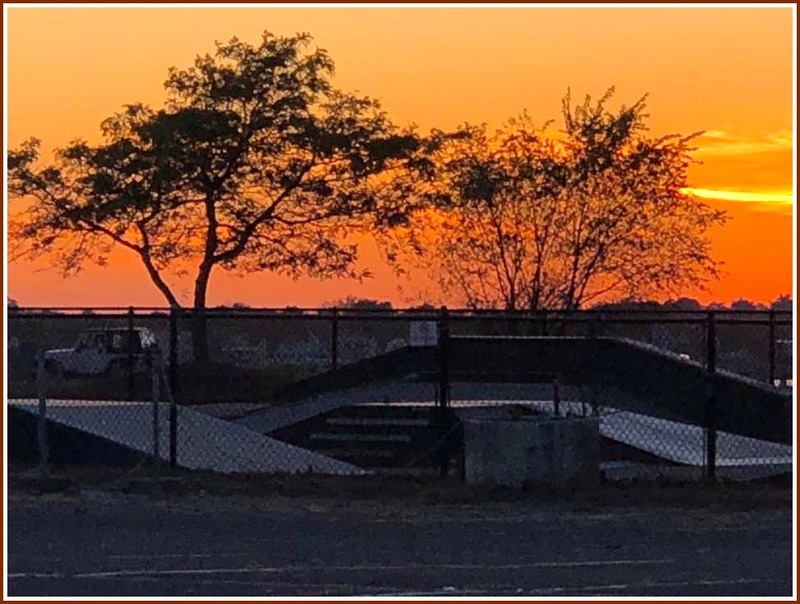 Last fall, when the skate park was threatened during controversial plans for the Compo Beach renovation, dozens of sk8trs and their parents spoke eloquently for its survival. They described its importance for kids in passionate, athletic, community-building — even life-saving — terms. It was spared the hook. This summer, I — and I’m sure many other Compo lovers — have looked at it with new, more appreciative eyes. Recently, the skate park has sported a new look. Colorful, mural/graffiti-type painting has turned gray concrete into something much jazzier. But some Westporters wonder about the advertisement (top) for Utopia Skate Camp. It’s also visible from other angles. A bit out of place — and overly commercial — they say. Time for an “06880” debate. What do you think about the new look of the Compo skate park? Have you had any personal experience with it? Who (or what) are these Utopia dudes? Click “Comments” — and please use your full, real name. 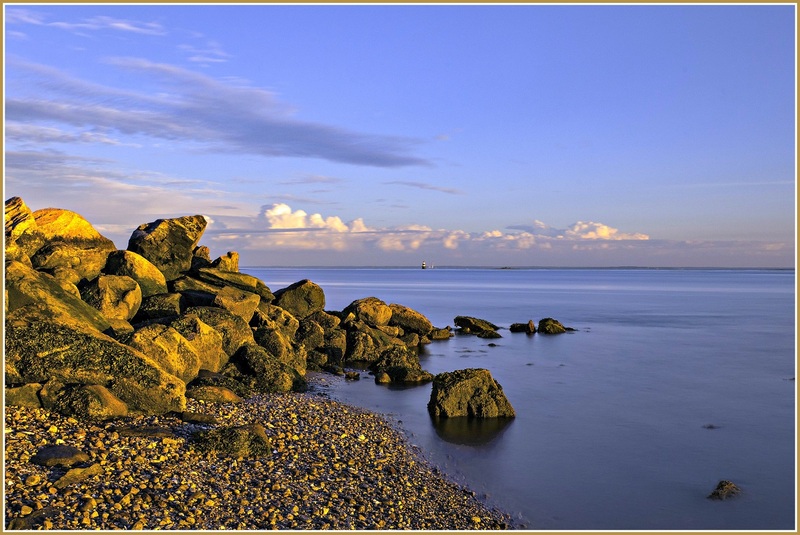 While discussion about the Compo Beach renovation plan has died down recently — the calm before another storm, perhaps — a subset of users has been quietly at work, hoping to save their beloved section of sand. It’s not a group known for their political activism: skateboarders. But there’s a grassroots effort in town to save the Compo skate park. On Saturday afternoon — the final weekend of the beach’s skateboard season — they sponsored a skating party, with pizza and a DJ. The weather was fantastic, drawing luminaries like 1st Selectman Jim Marpe and Compo Beach Improvement Committee member George Franciscovich. A small part of the big crowd of Saturday’s skaters. 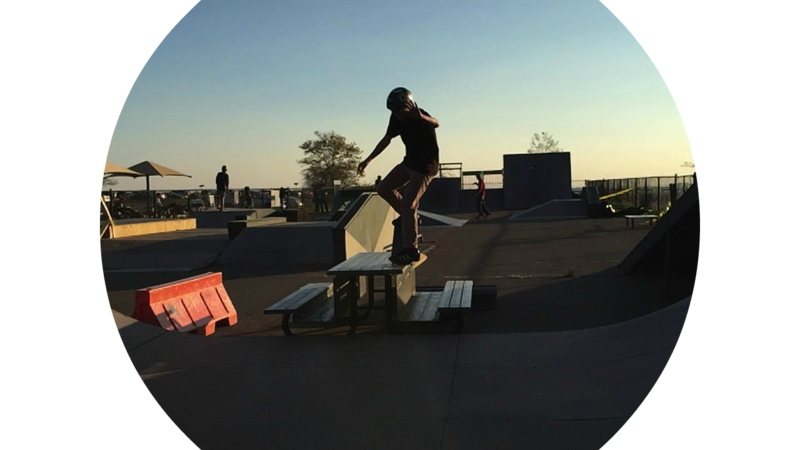 The skaters will be out in force this Thursday (October 30, 7:30 p.m., Town Hall) for the next Parks and Rec Commission/Compo Beach Site Improvement Committee meeting. It’s listen-only for the audience, but they want to hear what’s in the works. 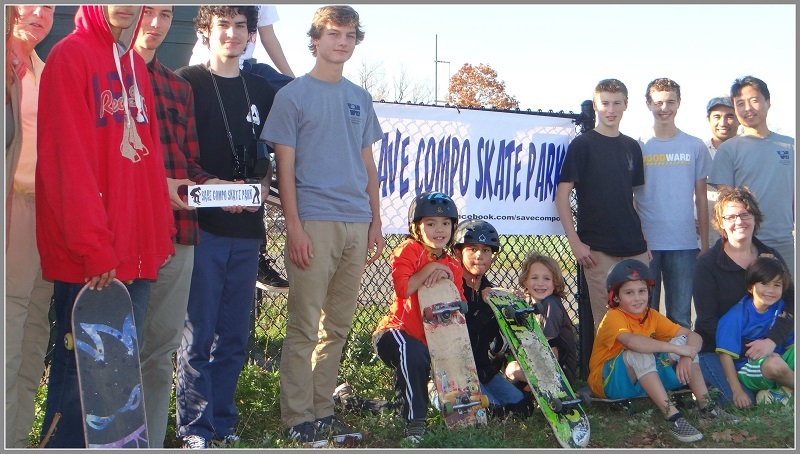 They’re figuring out how Compo’s skate park can be brought up to date to enhance its appeal and safety, and lower maintenance costs. They’re marshaling plenty of good arguments. They’re learning how to participate in town democracy. They may wipe out once or twice. That’s part of the process. If so, they’ll get right back up. They hope to be standing — and skating — at the end. Everyone’s talking about the big changes proposed by the Compo Beach Site Improvement Committee: a new entrance, renovation of the bathhouses, elimination of perimeter parking. Hardly anyone has mentioned a smaller plan: the end of the skate park. Eddie Kim knows the stereotypes of skateboarders: “hooligans, drug dealers and delinquents.” He also knows the Compo park attracts a wide variety of people, like a fearless 8-year-old girl who loves riding down ramps. She loves the park, and would be devastated to see it close. The Compo Beach skate park. Kim works at the park. But during the school year he’s a teacher. He practices Bikram yoga daily, and founded his own theater company. He’s a skater too. For him, skating is a creative way to relieve stress. Kim wants Westporters to see the value of the skate park, and the community that has grown around it. He asked several regulars to offer insights. One of the most eloquent is James Bowles, a Staples freshman. James knows that many people can’t understand why he’s spent “every free minute” of the past 6 years on a skateboard. He says that when he was 6, at Long Lots Elementary School, he was diagnosed with OCD. For the next couple of years he hated his life. But the moment he set foot in the Compo skate park — “heading into the great unknown” — he was hooked. His fears and stresses vanished. He was hooked. He visited the park every day. He dreamed of skateboarding at night. He met his best friends there. They’re different ages, but they gave him a sense of self-worth, of potential, of community. That’s something every kid needs. The Compo Beach skate park draws quite a mixed crowd. 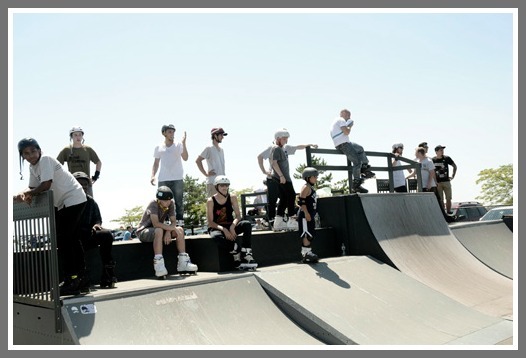 This summer, James worked as a counselor-in-training at the Compo Beach Skate Camp. “Seeing the joy on kids’ faces when they finally roll away from a trick they worked extremely hard to land is mesmerizing,” he says. Some of them may have been going through their own troubles, as he had. Even though I’m still young, I’ve seen bad things happen to good people. Kids my age are swept up into partying, drinking and general idiocy. Most people assume that because I skateboard, I get caught up in that sort of stuff. I believe that if it weren’t for skateboarding, I would have been more likely to do that. The amount of times I’ve turned down plans to do ludicrous things, because I wanted to go skate, is enough to know I’m doing something right. Skateboarding has been one of the best investments of my time. James says that the freedom of skateboarding has allowed him to work through his OCD. It has also helped him learn to be polite, pick up after himself, and look after others. Plenty of skaters gain confidence and a sense of independence at the park. And, she says, skateboarding’s emphasis on fun and individual growth — not “fierce competition” — appeals to youngsters who may not be interested in team sports. Parent Debra Newman has seen many kids flocking to the park in 90-degree weather, with no shade. “Would we rather have them sitting in front of the TV, exercising their thumbs?” she wonders.